Sure, right after that comes moussaka, another Greek addiction, but it’s a bit more complex and a bit more wintery, so maybe this fall I will give the recipe of mine low fat moussaka! Right now, for you barbecue or your al fresco night, here it’s Cuisine et Vins de France‘s Tzatziki: why buy it if it’s so damn easy??? Grate the cucumber and let it drain cover in sea salt for at least half an hour. Squeeze it, and mix it with the rest of the ingredients (except sea salt that you already used). Cover it and let it rest in the fridge for at least 1 hour. I must get some Greek yogurt and make this right away! I love the stuff. 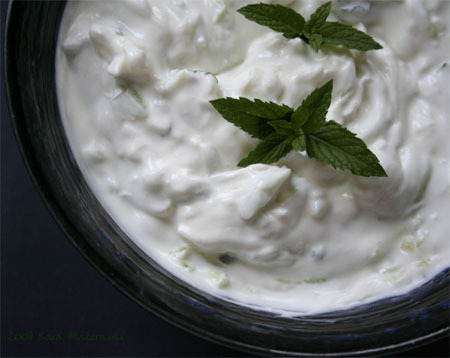 I adore Greek yogurt–and garlic and mint. So, I’m making this for sure! I add fresh dill and juice of a lemon to brighten it up a bit. Not that it needs it with the clean bite of the Greek yogurt. I can’t go back to plain yogurt anymore. Oh and if you want it a touch thicker try with Mediterranean yogurt. It’s like thick sour cream but with better flavor and texture.